"You can't give one without the other." My mother repeated these words every time my father would buy a new bicycle for me but neglect to do the same for my sister. Fair, after all, is fair. I mention this because after researching last week's Fantasy Garage superstar, the Shelby Cobra Daytona Coupe, not including the 250 GTO would be sacrilege. We can't have one without the other. After all, the reason the Daytona is so breathtakingly fantastic is because it had to compete with this Ferrari. Put another way, without the Ferrari 250 GTO, the Daytona Coupe wouldn't exist. Was Muhammad Ali any less of a fighter because he lost one to Ken Norton? [Ed Note: oops!] Of course not. And there is no doubt that when the 250 GTO debuted in 1962, it was the greatest car in the world. The truth is, we could easily fill half our 50-slot Fantasy Garage with Ferrari 250 derivatives (a black 250 PF Coupe anyone?) as they are just so friggin' special. The very first 250, the S, won the Mille Miglia in 1952 and did well in both Le Mans and Carrera Panamericana. Anyone else remember feeling more attracted to Cameron Frye's dad's (replica) 250 GT California Spyder than Ferris's girlfriend? Sandra West chose to be buried in a 330 America (it had a 250 chassis and engine). We should all be so lucky. The "Breadvan" would be one of the top three cars in my own personal Fantasy Garage. And of course, Steve McQueen drove a 250 GT Berlinetta Lusso, which just about secures the 250 as the coolest car of all time. Even with that pedigree, the GTO is without question the top dog in the 250 pack. 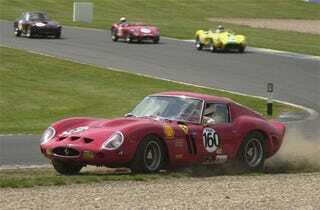 Some might make a case the 250 GTO is the top car in the world. It is certainly the most expensive, with one trading hands in 1991 dollars for – I hope you're sitting down – $15 million. In 2007 money that's eleventy seven billion dollars. Things have calmed a bit since the peak of Reaganism. If you want a 250 GTO nowadays you need only shell out $10 million. Assuming you can find one. You can't. And even if you do, it probably isn't a real one. Over one hundred times as many phonies have been built than actual 250 GTOs. Why though? What is so damn special about this car? Where to even start? How about with the name? GTO stands for "Gran Turismo Omologato," which translates to Grand Touring Homologation. Racing rules of time stipulated that 100 production cars must be built in order for a vehicle to race in the GT class. Ferrari only made 39 GTOs, period. How this was allowed to stand still remains a point of contention even today. Enzo claimed the GTO was just a body modification of the brick-like 250 SWB, and was thereby following the rules. Aston Martin, Jaguar and Chevrolet all cried foul.. As we'll see in a moment, the other manufacturers were right. Whether the FIA governing body bought Enzo's story, or just decided that the sport would be better off with team Ferrari competing is anybody's guess. Point is, these mothers are rare. Let's back up to 1961. Things were sailing along smoothly at Ferrari, as the SWB GT was simply dominant in the GT class. But then a young sales manager named Girolamo Gardini returned from the unveiling of the Jaguar E-Type at the 1961 Geneva Motor Show. According to Giotto Bizzarrini (yes, that Giotto Bizzarrini) once back at Modena Gardini ran around the factory shouting, "They are going to beat us with their new GT!" After being sufficiently convinced of the impending doom, Enzo greenlighted the GTO project (albeit in secret) and put Gardini in charge. Development fell to Bizzarrini. Legend holds that Bizzarrini headed up a small team that ripped apart the 250 GT SWB chassis he had developed earlier and replaced most of the parts with smaller, lighter tubing. The driveline was lowered and the 3.0-liter V12 from the prototype-class Testa Rosa was fitted behind the front axle along with a dry sump lubrication system to further lower the center of gravity. All 250s featured the Tipo 168 V12 (each cylinder sported 250 ccs of displacement – 250 x12 = 3000 cc), but the newer 168/2 engine featured larger ports, lighter materials and tighter tolerances. Output was over 100 hp per liter (302 hp), which is still impressive more than 40-years later for a normally aspirated motor. More importantly, the GTO's V12 weighed less than half what Jaguar's 3.8-liter straight-6 did. A test mule was flogged around Monza and the results were stellar, as it was several seconds faster than both the Le Mans winning SWB and Sperimentale. Remember that the GTOs could hit over 180 mph on the Mulsanne Straight. Then disaster struck. Known as the "Palace Revolt," none other than Enzo's wife got into it with a bunch of Ferrari employees in October of 1961. As is usually the case with fights of this nature, the wife didn't lose. So, Bizzarrini, Gardini and many others got the boot. Obviously the timing was horrible as the GTO was nowhere near complete. The GTO project was then assigned to a young engineer named Mauro Forghieri who wound up doing very little to Bizzarini's work save for adding a small rear spoiler and Watts linkage for extra stiffness. Sergio Scaglietti finished refining the body in a wind tunnel. The results were the stuff of both history and dreams. The 250 GTOs utterly whack-a-moled the competition. In its first race at 12 Hours of Sebring, Phil Hill and Olivier Gendebien were initially upset that they'd be driving a GT car, and not a fancier prototype. When the race was over, the two drivers and the GTO had won the GT class and amazingly finished second overall behind a Ferrari 250 TR. Le Mans was much the same story with Jean Guichet and Pierre Noblet finishing first in class and an amazing second overall, trailing the winning Ferrari 330 LM's average lap speeds by just two mph (113 mph vs. 115 mph). Another GTO finished third, with two E-Types in fourth and fifth with yet another GTO placing sixth. Until Shelby showed up to Le Mans with his Daytona Coupes two years later in 1964, the GTO was simply untouchable. And while the American car won the class and finished fourth overall, the GTO was fifth, ahead of all the other prototypes. Actually, the GTOs still managed to win the 1964 overall GT Championship by winning Daytona, Spa and the Tour de France – Shelby only won the big one, Le Mans. In 1965 the FIA lifted the cap on engine displacement and more mid-engined monsters began turning up.Also in 1965 Ferrari replaced the 250 GTO with the 275 GTB (referred to by many as the '65 GTO) which again won the Le Mans GT class outright and finished third behind two prototype mid-engined 250 LMs. While the looks of the Daytona Coupe are open to interpretation (we love it, but...), there isn't a soul on earth who can call the 250 GTO anything other than gorgeous. The Scaglietti bodywork is simply captivating, bordering on savory. We love all the serious-looking vent work cut into the body and especially dig the three "D" apertures on the nose which can be opened to vent the cabin and then closed for high speed runs. Plus, all GTOs ran on wire wheels, which only add to the hotness. The cabin was sparse (no speedometer) but nonetheless luxurious. Hey, we're suckers for wooden steering wheels. We've been racking our brains trying to come up with a single reason why the Ferrari 250 GTO should not be inducted into the Jalopnik Fantasy Garage. We can't think of a single one.